The Northumberland Ogle/Ogles Family Reunion was a thrill of a lifetime! Adventure is in our DNA! With the same adventurous spirit of our ancestors who traveled to the New World looking for a new life, we made our way across the pond to experience our own adventure and see how our ancestors lived in another land, and in the meantime got to meet and spend time with a new group of cousins. Forty-six Ogle cousins from around the US walked in the footsteps of our ancestors on our reunion in Northumberland, Sept. 2017. We were lucky enough to have a family from the Samuel Ogle line (3 times Gov. of MD) at the reunion. As we visited the many family sites, we were amazed at how Many Ogle crests/shields we saw at every turn – in churches, on castles and some even spotted them at a museum on a pre-tour visit of Newcastle. People took hundreds of photos in hopes of capturing the feeling and essence of living during the time and in the places of our ancestors. Our hosts at each stop gave us interesting family stories, history lessons and tours – all graciously giving us specialized details of their location. Many set up special tea and dessert areas for us to enjoy. The thrill of seeing a communion chalice dated 1571 that many of our ancestors used was exciting! As we marveled at the medieval church buildings with many Ogle memorials, we realized the enormous impact our ancestors had on Northumberland. We heard stories of how their support helped the churches restore and expand over time. We know from historical documents, the list of names and occupations of Ogles in Northumberland is numerous and included constables of castles, sheriffs of Northumberland, members of Parliament, a dean of a cathedral, a Tudor courtier, admirals of the fleet, and soldiers that fought in many important battles that shaped the history of the border area and England. Each person attending had a different experience to call his or her favorite. The rolling green hills covered with grazing sheep gave us peaceful feelings as we rode on our tour bus through the beautiful countryside. Many liked the churches with their intricate wood carvings, medieval stained glass windows (including white rose of York showing our ‘Yorkist’ support during the War of the Roses) and Ogle memorials … while others enjoyed the small towns of Corbridge and Morpeth, showcased by their little English cottages and flower lined streets. Jim Dix — Our Ogle reunion group was on their 4th day of touring the numerous sites associated with their Ogle family homeland. We had just concluded our ceremony naming Ogle Pond at Kirkley Hall, and we had moved on to our tour inside St. Mary’s Church located in Ponteland. Professor Bailey was finishing up his very informative talk about the Ogle memorial located on the left side of the altar, when I began looking at the right side of the altar for other family names associated with this ancient church. There I saw a large plaque on the wall with the name DIX, which is my own family surname. Since my family genealogy is well documented back to 1600 in Germany, it was a shocker to see this Dix memorial in the altar area of this “Ogle” church located in Northumberland, England. 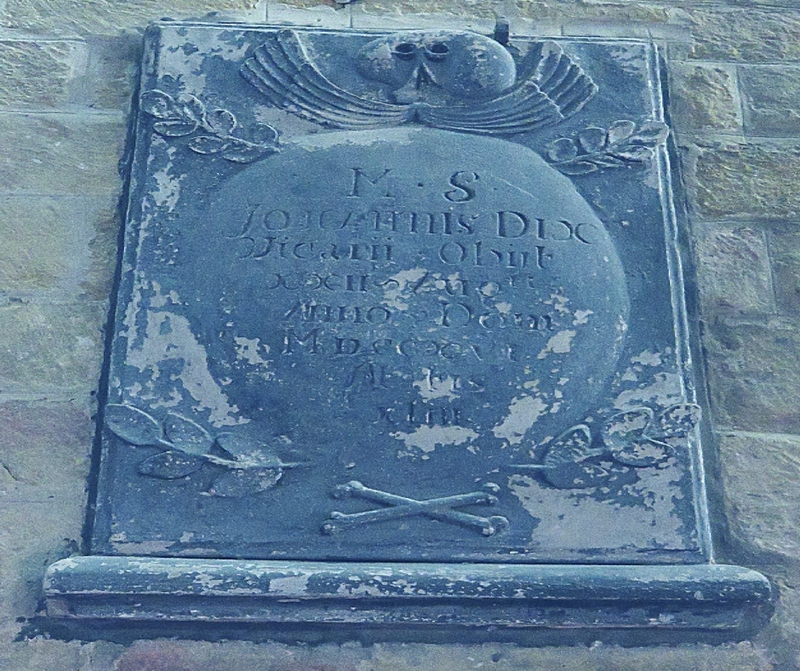 The lettering on the plaque was in Latin, so I even thought maybe the letters DIX were a Roman numeral, or some other explanation. But then I recognized the name Johahnnis Dix, but I could not understand any other words. Who was this person, and why would he have a memorial in the altar area directly across from a prestigious Ogle memorial? Later, I asked our guide, but he did not know. However, he said he would look into it, and get back to me with whatever he found out. One month later I received an email from him with some information. John Dix was born near Oxford, England in 1673. He received a M.A. degree in 1698 from Merton College, Oxford, England. He became Vicar of Ponteland Parish in 1712, but was only a member for about 4 years. He died at the age of 43 in 1716. Apparently, the congregation liked him since they placed his memorial in such an honorable location, so close to the most prominent Ogle memorial near the altar. Now, I have been given a couple more pieces to the Dix family puzzle, but the mystery also got bigger when I was least expecting it. Isn’t genealogy fun? Kirkley Hall’s walled garden was a unique experience as was the antique treasure filled Eglingham Hall and Cromwell tearoom. Yet others enjoyed most the new cousins they met and hope to see again. At the farewell dinner we enjoyed the music of the Watchorns, Northumbrian small pipes and fiddle, and everyone’s favorite song was the one thought to be inspired by Lady Catherine Ogle of Bothal Castle! One week was not long enough, so as we said farewell to our cousins and Northumberland, we hope to return someday. Farewell to Northumberland- That's the end of your tour guide's photos…Great trip and reunion! Hope to visit again someday! Trip members please post your favorite photos. Laurel, How splendid to meet some real, live Ogles! Could you tell Larry and young Adam that if they pay now for the draining of the vault, I shall arrange for two spaces to be left empty pending the days they require their occupancy!! I very much hope that everyone finds the visit to Northumberland charming and that we meet up again one day. Anything I can do to assist in follow-up just let me know. Thank you so much for your email and the group photo. I can assure you that it was a great pleasure not only for the College but particularly for me to welcome the Ogle/Ogles again after such a long gap since the last visit and it was particularly good to speak to the two members who had been on the 2005 visit. I really do want to re emphasize how grateful we all were to receive the support, which your group provided for the development of the Ogle Pond. I can assure you that it will be well publicized and developed as an important feature of the Estate. I have already spoken with the Principal and David about ensuring that the pond is well identified in College publicity. I must say that I really enjoyed Chairing the Committee, which ensured that the pond was completed in time with David managing the project and his staff and students doing all the work, involved. I was pleased to hear that the naming event proved to be a success by your Group. I am sure that the whole of your tour was a great success since you were visiting places I know quite well and I have always found them to provide genuine Northumbrian hospitality, which I hope your Group experienced. Once again sincere thanks for all the support that was provided. Be sure to check out our Facebook page for more fantastic photos. This entry was posted in Events and tagged Northumberland family reunion. Bookmark the permalink.